Raising Grass Fed Wagyu Cattle Naturally on a Family Farm in the Foothills of Appalachia. 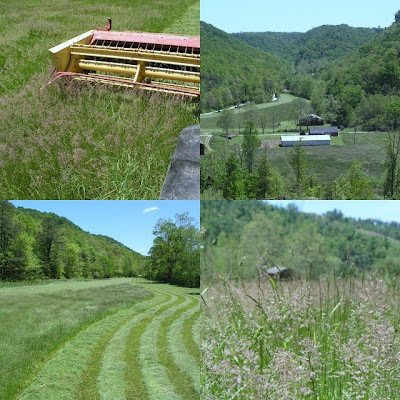 While making hay this past summer, I was mesmerized by the quantity and quality of bluegrass growing on our farm. For the highest nutritional content, I probably should have cut this hay a week or two sooner, but what an impressive display it put on thanks in part to my tardiness! I suppose the conditions were perfect for bluegrass this season. One of my goals for improving the sustainability of our farm is to convert some of our hay fields to pasture each year. It's hard work to build durable fences, but each time I fence in a hay field and put it into rotational grazing service, I decrease our reliance on diesel and equipment. I've attended the "Master Cattleman" and "Master Grazer" courses that are given by the University of Kentucky extension service and I understand the benefits of rotational grazing and stockpiling fescue, but I doubt it will ever be possible to manage our land profitably without making or purchasing some amount of hay for our farm. As long as I have to make hay, I'm going to try and make the best hay possible. And no shortcuts either - we never use herbicides to kill weeds or chemicals to fast-cure the hay.